My recent paintings experiment with and assess the personal impact of the artistic canon. In superimposing the art historical canon over my own paper doppelgänger, I engage in a form of portraiture similar to what Svetlana Alpers refers to in The Art of Describing as the “historiating portrait” (14). Such figures “are distinguished by looking dressed-up rather than transformed” (14). Alpers concludes that the intentionally unconvincing results required a “collusion between portrayed and portrayer” (14). Her text disambiguates paradigm differences between the art of northern Europe and Renaissance Italy. In one such case, she shares that Dutch commentators “considered that working out of one’s store of visual memories…constituted working out of oneself” (40). The seemingly derivative and disjointed nature of a series of historical paper dolls is neither mindless nor failed imitation. The personal and traditional collide, collude, and correspond in a number of ways. The defining feature of any collection is the criteria governing what is included or excluded. As Susan Stewart points out in her analysis of collections in On Longing, “The collection is a form of art as play, a form involving the reframing of objects within a world of attention and manipulation of context” (151). 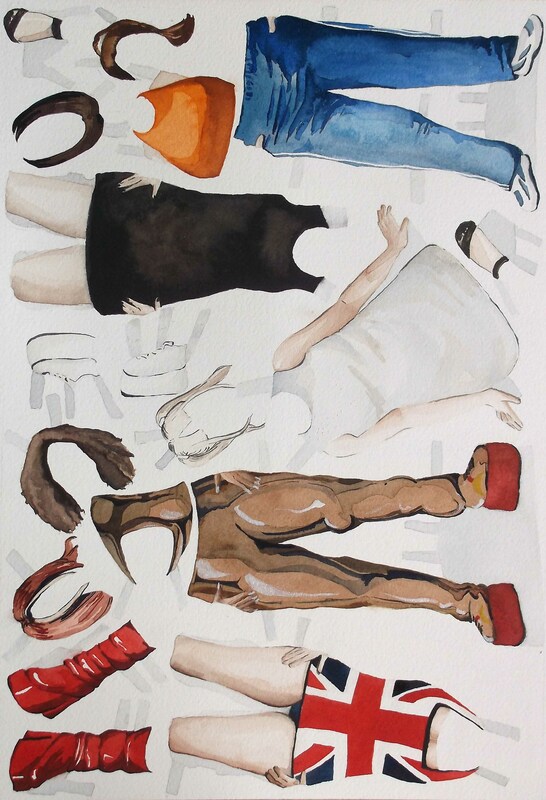 The structure of my paper doll series follows what Nanette Salomon identifies as two main strategies addressing lingering imbalances and codified sexism in the canon of art history: “the appearance of women as critics and interpreters” and “the excavation of women as creators” (“The Art Historical Canon” 349). These procedures provide the unity and driving force for my paradoxically whimsical, sincere, and analytical collection of paper dolls. 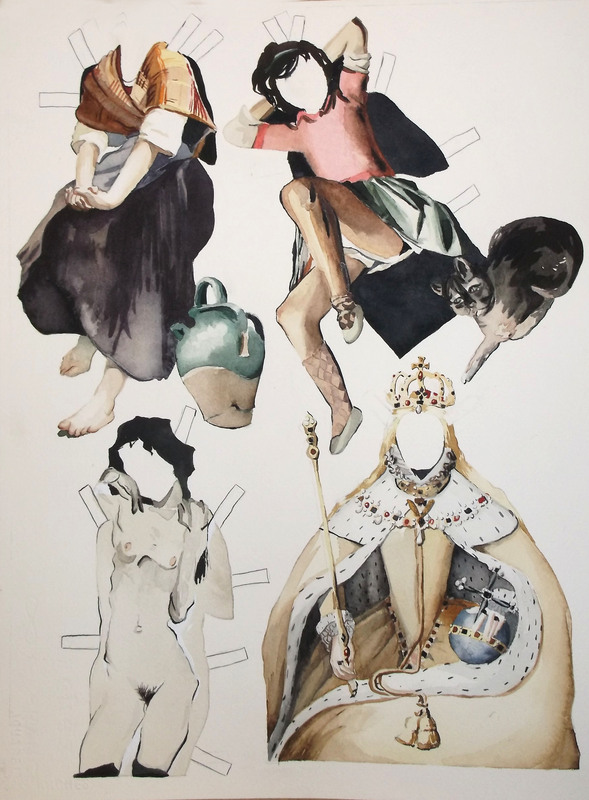 Nubile bodies: Bouguereau, Balthus, Schiele, and a portrait of the Virgin Queen. Paper doll costumes. Watercolor on paper. 11 x 15 in. March 2014. Perpetuating these symbols is not necessarily tantamount to reinforcing them. Judith Butler points out the subversion of meaning while describing drag in Gender Trouble. As Butler explains, “Although the gender meanings taken up in these parodic styles are clearly part of the hegemonic, misogynist culture, they are nevertheless denaturalized and mobilized through their parodic recontextualization” (188). She later describes these as “imitations which effectively displace the meaning of the original” (188). This displacement and slippage of meaning are one of the primary reasons for presenting art history references as paper dolls. The conflation of children’s toys (or modeling tools) and high art, the forced equivalence of anachronistic images sharing space, and the parallelism of playing dress up and performing gender all affect the signification of what they remix. Please recall that Salomon’s other strategy for parity in art history was added attention to “women as creators.” The first part of that process involves treating handicrafts and other “woman’s work” with greater respect. Gender parity in fields or publications already accorded high status is also important. This progress (or lack thereof) is monitored by projects such as the annual VIDA count of representation in literary publications by gender and the Guerrilla Girls’ similar tallies in art museums. A third way to add such attention is to consider the importance of the few outliers. A recent PSA video reminds us that “If she can see it, she can be it” (See Jane). Child development psychologists debate the relative influences of nature and nurture, but the indisputable importance of modeling is the reason why half of my current series is dedicated to women’s self-depictions. Their relative obscurity in comparison to other images appropriated from the art history canon does not obviate their personal significance. Self portraits by women artists exhibit certain themes. In Figure 2, each of the modified self-portraits addresses their role as a mother in particular ways. Kahlo was unable to have children and repeatedly painted monkeys into her self-portraits as symbols of those “desperately desired” children (Heller, Women Artists, 147). Modersohn-Becker painted this self-portrait before her first (last, and fatal) pregnancy. Vigée-Lebrun’s self-portraits with her daughter simultaneously showcased her ability to capture likeness and her reassuringly maternal qualities. The parallel between artistic and biological creation is somewhat altered when presented by female-bodied artists. More pointedly professional self-portraits by women often betray a certain ambiguity related to the internalized male gaze. 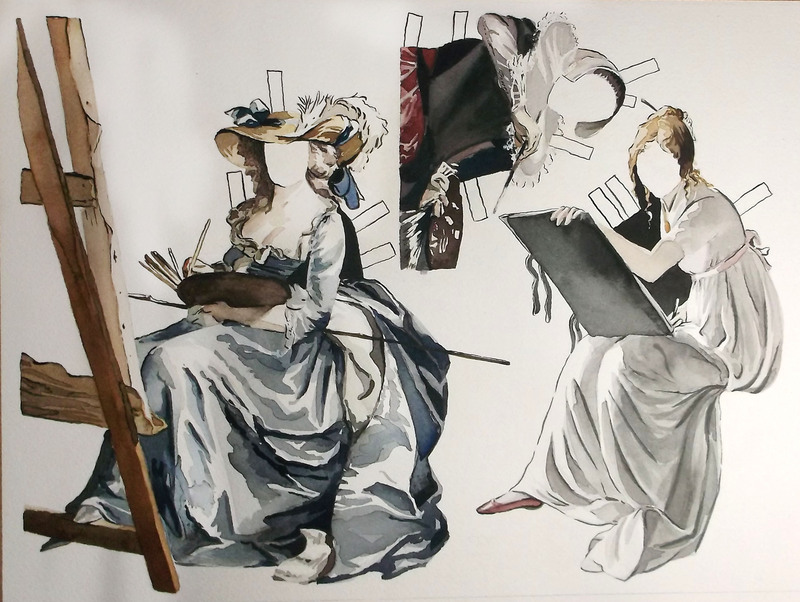 Adélaïde Labille-Guiard, Judith Leyster, and Marie-Denise Villers painted themselves in the act of creating art, but undermined that authoritative position with their inconvenient clothing. Fashionable elements like voluminous skirts and wide ruffs would only detract from their ability to see, paint, or draw, but are nonetheless carefully depicted. These impractical and implausible elements are a visual equivalent of independent attestation: they contradict the artist’s main point, and are therefore significant. Not every page of my project requires extensive knowledge about art history or gender theory. References to immature or introductory conceptions of feminism seem particularly relevant to a project that uses the format of childhood toys to process adult concerns. During the nineties, I would never have referred to feminism. Instead, I was far more likely to adopt a British accent and chirp about Girl Power. Fig. 4. Everything I knew about feminism during the nineties. Paper doll costumes. Watercolor on paper. 11 x 15 in. March 2014. Yes, the Spice Girls produced pop, with all the incoherent lyrics and nonsensical posturing that implies. Little girl or vamp archetypes were presented as harmonious with (and equally valid as) those of the sophisticated, athletic, or fierce woman. However they read today, during the nineties the Spice Girls provided an initial vocabulary and impetus for young girls to discuss self-confidence and solidarity. Contemporary feminist writing often emphasizes individual agency rather than policing the form it takes. In the context of this eclectic approach to portraiture, consider Butler’s question: “To what extent is ‘identity’ a normative ideal rather than a descriptive feature of experience?” (23). Her question is part of a larger challenge to cultural preconceptions about fixed and easily-comprehensible gender identity. It reminds us that individuals and culture are forever mutable. Language and visual precedent shape, but do not determine, our thoughts about what is possible. I was honestly surprised when asked recently whether making a series of feminist paper dolls was a tragic or depressing process. Gender parity is not yet a reality, but celebrating and thereby encouraging diversity enriches the future. Alpers, Svetlana. The Art of Describing: Dutch Art in the Seventeenth Century. Chicago: University of Chicago Press, 1983. Print. Heller, Nancy G. Women Artists. New York: Abbeville Press, 1987. Print. Salomon, Nanette. “The Art Historical Canon: Sins of Omission.” The Art of Art History: A Critical Anthology. Oxford: Oxford University Press, 1991. Print. See Jane. PSA video. Geena Davis Institute on Gender in Media. Hero 4 Hire Creative. n.d. Web. 30 March 2014.